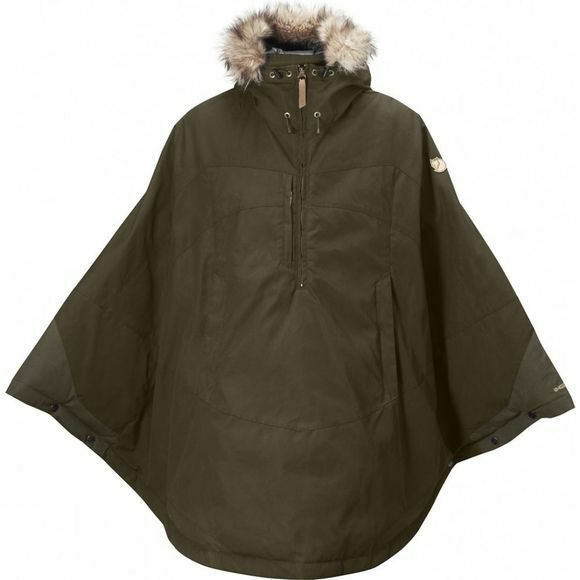 The Fjällräven Men's Luhkka is a smart knee-length cape inspired by the Sami's versatile and practical Luhkka. It can be worn on its own during the autumn and spring and as a reinforcement garment over normal winter clothing on cold winter days – just as the Sami have always worn it. When worn over normal shell garments it offers flexible protection against the cold and bitter winds, and any snow can be quickly shaken off before going indoors. A thin synthetic lining has been added to the strong, wind and water-resistant G-1000 fabric for extra warmth. The cape has a fixed, adjustable hood with detachable synthetic fur edging and a reflective band in the back. There is a half zip in the front and a G-1000 gusset in the opening with soft fleece on the inside. A breast pocket is positioned immediately beside the opening and further down there is a kangaroo pouch. Push buttons at the wrists hold the cape in place when you are on the move. Zip pulls and the trim are in natural tone leather.